I can hardly believe that it is November, and even scarier, by the end of this week the month is already half over! This really confuses me because surely just last week it was only August?! Despite my disbelief that Thanksgiving is just about 2 weeks away, I must face the facts and start planning! John and I will be headed to Minnesota to visit my parents for the week, and although we will be out of town for the holiday, I can’t help but get excited about incorporating Thanksgiving-type recipes into our weekly meal planning. When it comes to Thanksgiving food, I’m a traditionalist – turkey, stuffing, mashed potatoes, gravy and dinner rolls (and since marrying John, we’ve incorporated his favorite macaroni into the mix). Before incorporating any new recipe into the Thanksgiving rotation, it has to go for a test run. There are several new spins on classics that I’m looking to try and these cheddar biscuits are one of them. When it comes to a winning Thanksgiving recipe, I’m looking for something easy and delicious. 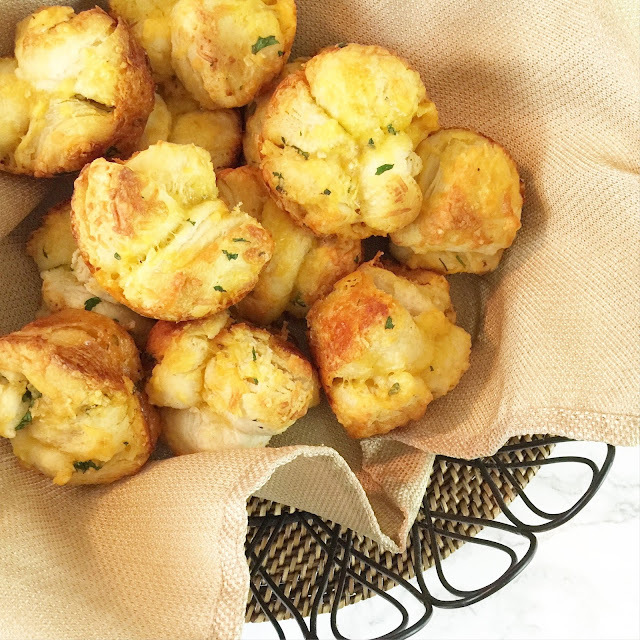 I’m not interested in spending 4 hours in the kitchen waiting for dough for the dinner rolls to rise – which is why the recipe is perfect… minimal effort with a fabulous result. Open the refrigerated biscuits, and pull each biscuit into four pieces. Place the biscuits into a large bowl and mix with the cheese, parsley, onion and garlic powder, and olive oil. Next, divide the biscuits between a greased dozen muffin pan, and bake for 10 minutes at 375 degrees. After the rolls have baked, remove from the muffin tin and serve immediately. Now, these aren’t exactly healthy (I mean, at all…), but when it comes to Thanksgiving (even more so than Christmas), I am all about indulging in my favorite comfort foods. And the coming of Thanksgiving means that the year is coming to a close (fast and furious too! 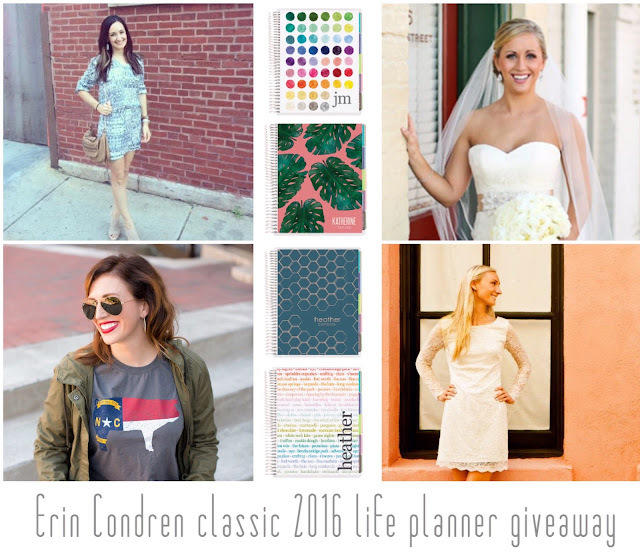 ), so I've teamed up with some of my favorite bloggers for an Erin Condren Classic Life Planner giveaway! I don't know about you, but a life planner is pretty much what I need right now, and I already have my eye on some great 2016 options! These look delicious! I seriously can't believe it's almost Thanksgiving, and almost 2016!! Oh my goodness those rolls sound delicious! I personally believe that adding cheese to anything makes it that much better! Oh my glob, these look amazing! Pinning for sure. Those will be perfect for Thanksgiving! Those look great and easy! Thanks for hosting this giveaway! Oh wow, yum! I might need to make these - like tonight for dinner! Definitely remembering this one! Fabulous giveaway - thanks for hosting! What a great giveaway - thanks for hosting! And these rolls look absolutely fantastic...T and I are planning to do our own little pre-Thanksgiving dinner at home soon, so I'm pinning these to add to that menu! Oh my gosh I can't eat those but I want them so badly!!!!!! These look delicious!! I might attempt to make these for Thanksgiving! Ok I need to win this one! I haven't gotten a planner yet for next year. And that sounds delicious, Lisa! Those rolls sound so easy to make and are perfect for the holidays! Oh my gosh! Those looks so delicious! Great giveaway, girl! Sounds easy and delicious! Must try them! I've always wanted to make something like this-- they sound sooo good and I would probably be so tempted to eat them all! These are perfect when you have guests coming over and don’t know what side to serve with dinner. Bonus points for being so easy!